About 8:30AM Thurs March 17 we got a call from the City Water Dept that our water meter was “spinning,” ie, the meter reader thought we had a leak. No telling when it started, perhaps the 9-below night in Feb. The City reads meters in November and March but not between. My daughter Karina and I went to investigate. It took a little doing to decide which of 3 meters, but then we saw the red hand on the gage zooming around like a second hand on a watch. Our house was built in 1910. The water used to come from a shallow well located in a concrete pit in the yard. Judging from the concrete in the pit, I’m guessing it dates from the 1940s. Iron pipe ran from the well to the house and a faucet in the yard. When we bought the house in 1993 the well tested high in nitrates so the house was connected to City water. The plumber ran a new line down from Pine Cone St to the existing faucet and tied into the existing system. He cut off the well from the system. The result is water flows in through a shutoff valve where the old faucet was, over to the well, and back to the house. All in old iron pipes. I shut off the valve between old and new and the meter stopped spinning. I shut off the valve under the house and turned on the valve between old and new. The meter spun again. Conclusion, the old pipes had failed outside, not under the house. Lucky for us we hadn’t left the house earlier that morning. 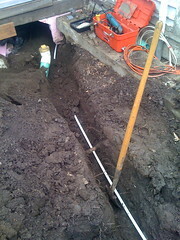 The simplest plan was to install 60 feet of new water line, leaving the iron pipes buried in the yard, but cut off from the system. I called the DIG-line and scheduled a Ditch Witch at MBS for Saturday 20th at noon. My daughter had fun with the upside down paint marking the route for the new line. Leaving the water shut off, we set about seeing how much fun we could still have on Spring Break. Saturday dawned with 2 inches of snow falling. About 10AM I shoveled the back deck, which needed to be dismantled to allow 12 feet of hand digging among electric, sewer, old water and an unknown iron pipe to reach the crawl space under the back porch. Gustaf Sarkkinen, Odd Jobs! joined the effort. He went down the access hatch to inspect and found several iron pipes that were rusty and weeping, but not leaking, at locations beyond the shut off valve. We decided to replace them as well. We decided not to get the Ditch Witch Saturday, because we were having enough fun in the snow and mud hand digging and the weather was closing in. It snowed again that night. Sunday I got the digging machine about 10AM and and Gustaf picked up parts. We had the trench in and began removing the old supply line so we could slide the new PEX through its hole under the foundations. A few feet of hand digging with a garden trowel in the crawl space and we got the new pipe in. Gustaf hooked up the line while I began back filling the ditch. By mid-afternoon we again had water to the house’s shut off valve, but a couple of the old pipes beyond the valve had been disturbed and were leaking. Gustaf cut out the pipes in the middle of some runs of soft copper while I went to Spence for parts. We learned our first lesson – the new Sharp Bite fittings don’t go on soft copper. Neither do solder fittings, you need compression fittings, so off to TriState because Spence was closed. With our new parts, Gustaf went down the hatch and discovered the pipe was not really 1/2 inch copper as he’d believed but 5/8 inch. Monday AM Gustaf arrived with 5/8 compression fittings. They did not fit. He took a sample of pipe to McCoy’s to see what fittings and knowledge they had. Lesson #2: when soft copper pipe freezes it expands to a size that won’t work with any fitting. The solution is to dismantle more of the system until you reach an unfrozen section or a joint that does not expand. So, we got a chance to remove more of the old pipes under the house. Another trip to MBS for parts. Monday afternoon I called the City Water Dept and shared that we had the problem solved and asked how to appeal our big water bill then I took my first shower in days. The water ran rusty for 2 days. Tuesday I put a new ground line on our electric system (we’d found the old ground tied to the hot water line and then finished filling the trench. On Wed I got the access under back porch crawl space re-closed and the deck re-assembled. Life is back to normal after a week. You are currently browsing the One small step for man blog archives for March, 2011.